Decodance.com have been selling Original Clarice Cliff and other Art Deco pottery for almost 20 years (including 15 years on the internet). 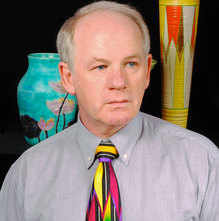 Decodance.com is run by Colin Mawston, who is himself a collector of Art Deco pottery and was one of the first dealers to sell on the internet. Colin is the author of British Art Deco Ceramics (released worldwide by Schiffers) and acts as a consultant to various BBC Antiques programmes. He has also appeared on Cash in the Attic as their "Clarice Cliff expert" and recently assisted with the making of the BBC Four series "The Glamour Years". He has also lectured on Clarice Cliff in the USA at the Wolfsonian Museum, Florida and participated in the Art Deco Weekend at South Beach, Miami. Decodance.com reguarly exhibit at various Antique Fairs (including Hove Town Hall, Alexandra Palace London & Detling) and also ship iems all over the world.